A computer scientist from Bonn built a nursery school in India. It is the moment he has been waiting for years: Dr. Peter Heyderhoff flies to Bangalore, to the south of India. Eleven hours flight and stopover in Delhi, then a good hour over land to Doddaballapur, mostly on unsecured streets, where there are no traffic signs, traffic lights and also no recognizable rules. 35 degrees in the shade, the air is dry and stuffy. Then, finally, it is time: Heyderhoff (78) sees the children, for whose safety, life and education he fights for years with all his strength. And for the very first time, the graduate computer scientist has planned, calculated and financed the whole project from Röttgen. Seven thousand kilometers from the South Indian Doddaballapur, sitting on his computer, in constant telephone contact with a single confidant on the ground: his longtime friend Arulappa Gerard. Dr.Heyderhoff had something quite different in mind. After about 45 years of work he wanted to enjoy life with his wife Rita, with his three grown children, he wanted to travel the world. However, his professional life was barely completed and his wife died of cancer. Dr.Heyderhoff mourned – and then took his life by the head. For him, an active Christian and committed to social life, was quickly clear: he wanted to help improve the world a little. He chose India. Years ago, he had taught Indian students as a scientist. Between 2005 and 2006, he stamped out a small hospital in the south of India. “On the flat land, where tourists are rarely lost, and people live in even greater poverty than in the metropolitan centers and their slum belts.” Whoever gets sick there needs money, or happiness: there are only a few doctors, and a good treatment is only available for money. As soon as the small hospital in Doddaballapur was finished, Dr.Heyderhoff saw that there was not only a great deal of distress in the care of patients. Especially the children needed help. And he knew: beside the small clinic was still unused building land. Dr.Heyderhoff managed to build a complete nursery school within only one year. On three floors, with rooms for sleeping, learning, play and dining. 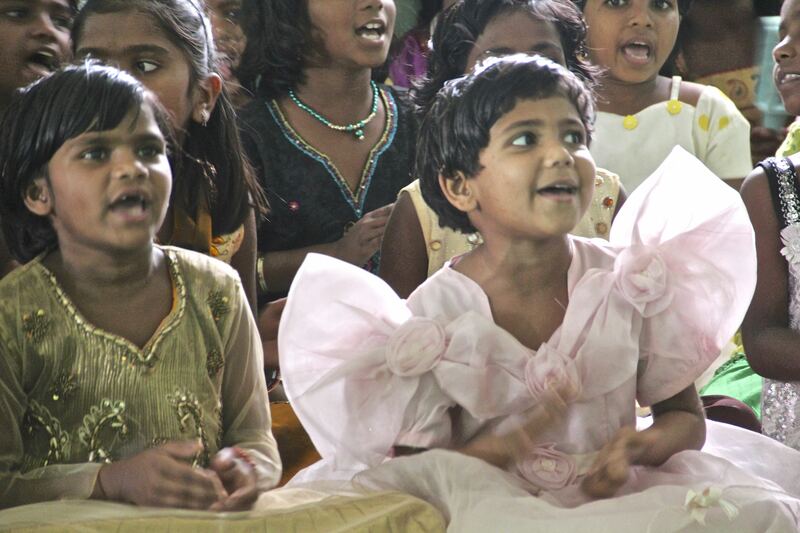 2013 was a festive occasion for children’s homes. Dr.Heyderhoff could not participate personally, but he called it “Childrenshome Rita”, in memory of his deceased wife. Today the children’s home is for 65 girls and boys between five and 16 years. Some are full-wives, many have only one parent, rarely there are still mother and father. And in all the family circumstances were or are critical. Like the little Rubiya. She’s seven, she’s been living here for about a year. When she is five, her father leaves the family, disappears without a trace. An abandoned woman and mother – in India, this is often a branding: women are ostracized, have to see alone how they survive. Rubiya’s mother lives in slum-like circumstances: a small cottage, three by four meters, a stone floor, which also serves for sleeping, no toilet, no running water, no electricity. Cooked mostly rice, on a fire place in front of the house. But Rubiyas mother got up, found a job as a housekeeper – and for Rubiya a place in Dr.Heyderhoff’s nursery. Because she has to go to work during the day. 2000 rupees, about 24 euros, she earns a month; The ruins cost only 500 rubles. Even in the poorest districts is living space, no matter how sparse it is, scarce and expensive. Rents also rise here. Just 25 euros costs the home for a child. Dr.Heyderhoff pays the amount 60 times, month by month. He is the founder and the main financier of his project (www.ashraya.de). He lives sparingly, only a small amount of his retirement remains. Donors and godparents are few – and are urgently sought. In order for the project to continue, “even when I do not live”. This is Dr.Heyderhoff’s goal. to eat, proper clothes – and especially the chance for education. The school visit in the neighboring town is part of the regular daily routine. Reading, writing, arithmetic, English. Dr.Heyderhoff knows: The only way out of the slums is through the school, but a graduation is not enough. That is why the restless retiree already has a new goal in mind: to enable his children to have vocational training. And so Dr.Heyderhoff goes from Doddaballapur via Bangalore to the Indian east coast. His goal: Chennai. There, a friendly relief organization has been successfully taking care of the education of older children who have completed the school. In the offer: classical professional goals such as nurse, locksmith, welder and carpenter. Dr.Heyderhoff’s longing wish is for his home children to get a seat later on when they have to leave the school and leave home. Even trainings for the IT industry are offered in Chennai: For the computer scientist Dr.Heyderhoff this is of course something very special. It all started with a man who was born in Bangalore in 1957 as the son of a distinguished family from a high caste. Dr.Gerard studied medicine and became a doctor. In great selflessness, he began his ministry with the aim of helping people on the margins of society, to bring hope to the hopeless, protect the sad, to give love to the outcast and to give them the love of Christ. He put his life entirely at the service of these people. At first he served as a doctor to the needy people. In 2002 Dr. Gerard set up a first center in the hut of an old woman and met there with initially 20 Christians. Already after eight months they had to move into three larger houses because of the enormous popularity. One year later Dr. Gerard bought a property from his own money and built the first meeting room. Every Sunday there around 300 people together. This center reached people on the fringe of society, and focused more on reaching out to the unattainted, filling the hungry and permanently changing the situation of these. With great dedication and selfless dedication, Dr. Gerard dedicates himself to bringing the disadvantaged people in his country close to the love of Christ. Ashraya Cross Road Center started in 2006 in Hallipura. Ashraya Breland Center, started in 2007 in Shettyhalli. Ashraya Baptist Center was opened in the same year in Doddabele. Ashraya Soldiers Baptist Center started in 2008, in Bagapalli. Its service includes a strong social component in the field of development aid. Dr. Gerard is no great effort to strengthen the spiritual life of the faithful. House groups were set up for this purpose. The first was in the village of Dodda-Malekere, others followed. So a house was built for Narasimha, a poor father with five children in Pulayanahalli. Ramakrishnappa, father of 3 children, lived with family in a leaking straw hut. Water dripped everywhere. He got a new house. in people who have been forgotten by all And lack of such simple things as basic medicine or a doctor who looks after a newborn baby. William Carey University, Shillong, Meghalaya, India. supported the work of his friend, Dr. Gerard, since the beginning in 1992.